Pieced boutique pillow with floral center and silk accents. EXCLUSIVELY AT NEIMAN MARCUS Solid velvet pillow. 0.5" top stitch flange. Feather/down insert. Zip closure. Polyester. Dry clean. 20"Sq. Made in the USA of imported materials. Velvet pillow with allover embroidery. Feather/down insert. Zip closure. Polyester. Dry clean. 20"Sq. Made in the USA of imported materials. EXCLUSIVELY AT NEIMAN MARCUS Pieced boudoir pillow with textured center, ruched inserts, and velvet sides. Velvet sides, mini welt and back. Zip back. Polyester/viscose. Dry clean. 13x19. Made in the USA of imported materials. 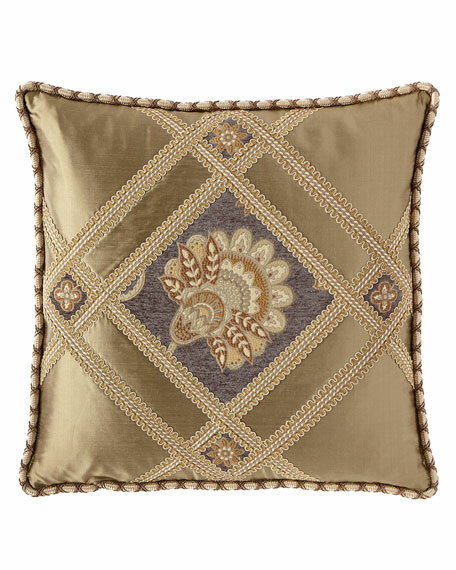 EXCLUSIVELY AT NEIMAN MARCUS Damask pillow with clean silk welt. Stripe back with zip closure. Feather/down insert. Polyester/acrylic. Dry clean. EXCLUSIVELY AT NEIMAN MARCUS Damask pillow with clean silk welt. Stripe back with zip closure. Feather/down insert. Polyester/acrylic. Dry clean. 20"Sq. Made in the USA of imported materials.